Former Boston Red Sox reliever Craig Breslow chats before his talk at Temple Aliyah’s annual Men’s Club dinner. 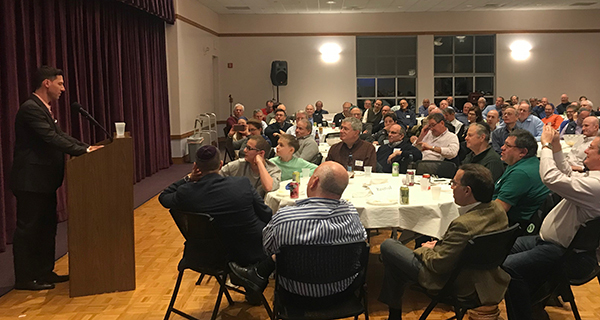 Just weeks after the Boston Red Sox won the World Series, it was only fitting that a former Sox champion would come to Needham to speak at Temple Aliyah’s annual Men’s Club dinner. On Wednesday, November 14, Temple Aliyah welcomed former Red Sox reliever and Jewish baseball player Craig Breslow to speak at their annual event. The dinner generally includes a speaker involved in sports, such as former Red Sox great Rico Petrocelli or current Boston sports media members Dan Shaughnessy and Tony Massarotti. 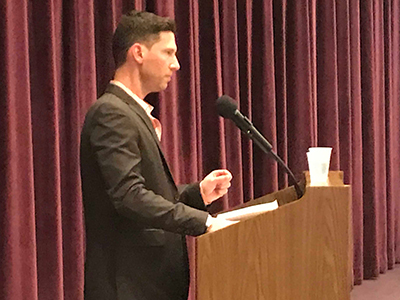 Despite the great speakers in the past, having Craig Breslow speak at the temple on Wednesday night was definitely a special occasion for the temple. The overall purpose of the annual dinner is to raise money for the temple and create networking opportunities. 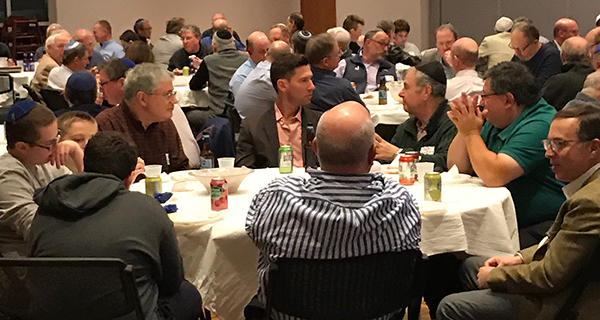 Former Boston Red Sox reliever Craig Breslow enjoys a repast with members of the community during Temple Aliyah’s annual Men’s Club event. There were around 125 people who showed up for the talk, and all of them were excited to meet the former Red Sox reliever and hear him speak. Breslow just finished a successful 14-year career in the Major Leagues, where he played on a variety of teams. However, the most meaningful team he played for during his long tenure in the big leagues was the 2013 champion Boston Red Sox. Former Boston Red Sox reliever Craig Breslow speaks at Temple Aliyah’s annual Men’s Club dinner. Breslow also shared his appreciation for the Red Sox’ latest World Series victory. Breslow is not your typical professional baseball player. For example, he went to Yale, majored in molecular biophysics and biochemistry, and had to show a tremendous amount of resiliency and dedication to even make it to the big leagues. Breslow began his speech by joking that another famous Jewish pitcher could not make it, which is why he showed up to the dinner. Breslow then delivered another self-deprecating line about his unlikely success in the big leagues. “This may come to a surprise to many of you, but a 5 foot 10 [inch] Jewish kid with a degree in molecular biophysics and biochemistry from Yale is not supposed to carve out a successful Major League Baseball career,” he joked. Breslow spent almost an hour talking about his journey to the big leagues, what it was like playing for the Boston Red Sox, his experience playing for the Israeli national team in the World Baseball Classic, and his overall thoughts on what he has learned over his long career. Breslow then held a long question-and-answer session, answering a variety of baseball questions from who was the most misunderstood Sox player (Manny Ramirez) to the differences between Alex Cora and John Farrell. He was also asked about what it was like playing in a small market like Oakland, and then transitioning to playing in Boston in 2013. He also addressed what he would do about the pace of play in baseball. For any Red Sox or baseball fans, it was a truly fascinating talk, filled with unique insight, laughter, and a compelling story about a true underdog. Unsurprisingly for a Yale graduate, Breslow was very eloquent, extremely bright, and thoughtful. At the end of the talk, Breslow explained that he wants to stay in baseball, either in a managerial role, a front office position, or as a media personality. Either way, Breslow was clear that he is not going to be a doctor (sorry, Ann Breslow), and that he is going to stay in baseball.